Though he is no stranger to writing fiction, this is Carl Barker’s first collection of short stories, 14 in all with the central theme of illusion. And by that he means the art of illusion used by famous conjurers when they perform their magic tricks in front of a rapt audience. 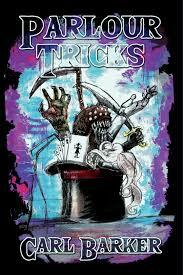 In the Afterword, Barker mentions what led him to create these tales with a horror theme to them and explains each on in The Inner Circle where the stories are based on the performances given by the conjurer; the death saw, rabbit from the hat, spoon-bending, raising the dead, card trick, musical interlude, Chinese water torture cell, ventriloquism, the human torch, the doves and fire-eating. Barker’s stories are loosely based too with fifteen ideas that work well as subject matter. What is most noticeable is how well-written the stories are. He doesn’t need a slick introduction from an already well established author to tell others how good he is at the written word. When you read From Chatterton Hill you already tell he can write with a style that both engages and gives you the thought that you will want to continue reading the next story and so on. The reason you read Parlour Tricks isn’t to do with the cover art by Luke Spooner, it’s the back cover image of Barker running from the strange moving ball in a funny attempt to recreate the scene from Indiana Jones and the Raiders of the Lost Ark movie, and of course the description of what the stories are like. Who doesn’t want to read about a soul devourer, devil worshippers in Blackpool and odd clairvoyants. It’s strange, macabre, but as I said, well-written. His work has appeared in many magazines and anthologies including; The Alchemy Press Book of Urban Mythic 2, Shadow Masters – An Anthology from the Horror Zine and Terror Tales of the Scottish Highlands. Each story is situational with characters who seem normal enough until you start delving into their pasts. In “With the Band” Bryan is called by Jukebox Willy who wants to reform their old band. The only snag is Jukebox and the rest of the band are long since dead. As both he and his lover, Sandra are the only two from the band who are still alive, Jukebox haunts them until the inevitable happens. The Substitution Trunk is the theme of the next story, The Cabinet of Ed Monroe where Edwin wakes to find a woman around him naked and dead, which leads him to think he might have killed her. Though this is such a strange notion, he can’t help but think it was possible, then the uncanny happens, a man in a top hat tells him the girl is part of his “act” and he is a performer of sorts, though Edwin still can’t tell if he is real or the stuff of his dreams. This is Edwin’s state for most of the story, yet the reader gets to discover the truth right at the end as Edwin has a wife who accuses him of sleepwalking through his life, intent on divorcing him as he has been a waste of time since they have been together. I suppose this way you don’t have to feel sorry for him when he goes through his ordeal. Houdini’s Vanishing Elephant Illusion is a variation on the classic Pepper’s Ghost and smoke and mirrors is the theme of one of my favourites here, The Man Who Came to Dinner. It is an emotional tale of death and reminded me of Brad Pitt’s role in Meet Joe Black where a mystery man comes to dinner to encounter only one man who will be taken on a special journey. I like that the stories all have themes and cater to everyone’s taste in horror stories, from the bizarre to the funny, the gory to the strange, Carl Barker will have plenty more to write and engage with.